What Dosages of Naproxen are Available? Naproxen is a nonsteroidal anti-inflammatory drug (NSAID) that helps relieve pain, fever and inflammation. The benefits of using Naproxen include availability, affordability, non-addictiveness and effectiveness. NSAIDs are hypothesized to slow the progression of Alzheimer’s disease but they are not a standard treatment for the disease. 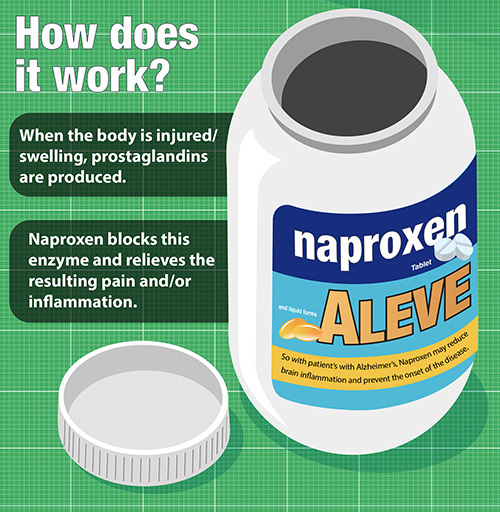 Naproxen works by blocking the pain-inducing enzymes and relieving the resulting pain and/or inflammation. The most frequently reported side effect are headaches, upset stomach, nausea, constipation, heartburn, abdominal pain, and influenza-like symptoms. Taking Naproxen with certain types of drugs such as Aspirin can have negative effects. 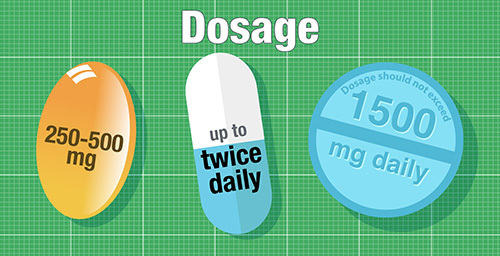 It is best to administer the lowest recommended dose to older adults. Patients should make sure that their physicians are aware of any underlying conditions. Naproxen is a nonsteroidal anti-inflammatory drug (NSAID). There are many medications classified as NSAIDs (e.g. Advil, ibuprofen). For the most part, NSAIDs are used to relieve pain, fever and inflammation. Naproxen is also considered a non-opioid analgesic. Non-opioid analgesics are pain medications that are used for mild to moderate pain, NSAIDs are just one category of non-opioid analgesics. Naproxen can be used to relieve mild to moderate pain. Doctors will sometimes decide to use Naproxen rather than using narcotics in order to help patients relieve pain. Naprosyn (common brand name) has been on the market since 1976 and became approved for over the counter use by the Food and Drug Administration in 1994. Availability: The medication can be acquired either over-the-counter or by prescription. Affordability: Naproxen is affordable for patients that live on fixed incomes. Non-addictiveness: Naproxen is not addictive like other opioids. Effectiveness: Naprosyn is an effective pain reliever. 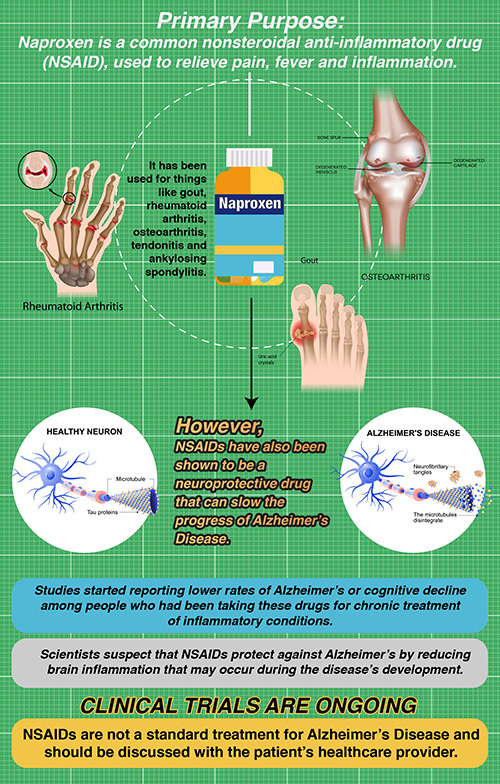 According to the Food and Drug Administration, Naproxen was studied on patients with rheumatoid arthritis, osteoarthritis, juvenile arthritis, ankylosing spondylitis, tendonitis, bursitis, and acute gout. Patients that were treated demonstrated improvements as evidenced by a decreased joint stiffness and a reduction in disease activity. Patients also reported an increase in range of motion. Patients that had ankylosing spondylitis reported a decrease in night-time pain and morning stiffness and pain at rest. These results were reported by both the patients and their physicians (United States Food and Drug Administration, 2008). Alzheimer’s Disease is a complex and often devastating disease that is characterized by memory loss and eventual loss of function. Dementia is not a normal part of the aging process, and it leads to persistent irreversible changes with cognition, language, memory, language, intellectual function, judgment and social function. Amyloid plaques contribute to inflammation and destruction of neurons in the brain of individuals living with Alzheimer’s disease. Nonsteroidal anti-inflammatory drugs (NSAIDs) reduce swelling and inflammatory response. NSAIDs are regarded as neuro-protective drugs that might slow the progress of Alzheimer’s disease. NSAIDs are thought to decrease the inflammatory response of mediators released from injured or degenerating nerve cells. NSAIDs are not a standard treatment for Alzheimer’s disease and should be discussed with the patient’s healthcare provider before adding the medication to the treatment regimen. Thus far, research on the benefits of using NSAIDs to delay or prevent Alzheimer’s is mixed. Observational studies have found that the use of NSAIDS is associated with reduced risk of AD, but randomized controlled trials have not found significant effects. Therefore, more research is needed to illuminate the relationship between NSAID use and Alzheimer’s risk. Naproxen is used to relieve pain associated with arthritis, gout, tendinitis, bursitis, menstrual cramps, headaches, and dental-pain just to name a few conditions. Naproxen is also an antipyretic; these reduce fever related to inflammation or infection. Individuals are cautioned to take Naproxen with a full glass of water or with food to decrease the chance of having an upset stomach. Taken this way however, the medication may take longer to work. The delayed release or extended-release tablets, a slower-acting form of naproxen, are used for treating chronic conditions because they do not work fast enough to treat acute pain. Naproxen may be taken in combination with opioids to relieve moderate to severe pain. Examples include hydrocodone and tylenol #3. Naproxen is an odorless, off-white crystalline substance. It is fat soluble and does not easily dissolve in water. Extended-release tablets are coated white tablets, the coating is pH dependent for delayed release. Naproxen tablets can come in a variety of colors depending on the manufacturer and the strength. Tablets can be white, yellow, blue, or pink. The liquid form of the medication may be light orange (RXlist, 2017). When taking over the counter Naproxen, remember to always read the label and take the medication as directed. Also, check the expiration date because if a medication is expired, it may not have the desired effect and could be toxic to the patient. Tracy is a 28 year old factory worker. She frequently lifts and moves heavy materials on her job. She woke up one day with pain in her lower back. She called her primary physician to get an appointment and was told that there was nothing available until the following week. Tracy tried soaking in the bathtub and using a heating pad, but she was not able to get any relief. Tracy went to the urgent care clinic, fearing she may have damaged her back in some way. The very helpful urgent care physician examined Tracy’s back and took x-rays. There was no damage to Tracy’s back. The urgent care physician gave Tracy a dose of naproxen in the office and wrote her a prescription to take at home. The physician educated Tracy on proper body mechanics and gave her a list of stretches to do to help her back. Tracy left the urgent care clinic and picked up her prescription at the pharmacy. Tracy felt relief from the pain. She took the doctor’s advice and now uses proper body mechanics when lifting items at work, and she stretches regularly. When she has pain, she takes the Naproxen that continues to provide her with pain relief. Gout is a type of arthritis. It causes pain, swelling and stiffness in a joint. Naproxen is not a cure for gout, but it can help relieve pain during an attack. The patient may be prescribed 750 mg by mouth initially, then 250 mg every eight hours. Leon recalls when he first began to have pain in his left foot. He went to see a foot doctor. The podiatrist took an x-ray and told Leon that he had a deformity in the ball of his foot. Leon says that the podiatrist gave him a special insert for his shoe and recommended surgery. Leon continued to have pain and went to see his regular healthcare provider who looked at his foot and asked him questions about his pain. Leon was diagnosed with gout. His doctor prescribed him Colchicine and Naproxen. Leon felt better over the next couple of days. He only takes the medication when he has flare-ups of gout and finds it to be effective for his pain. When treating chronic condition, Naproxen can be taken at the following strengths, 250 mg, 275 mg, 375 mg, and the 500 mg dosage can be taken twice daily. If taking enteric-coated naproxen, the tablets should not be broken, crushed, or chewed during ingestion. Larry is a 36 year-old man who has been living with rheumatoid arthritis for the past five years. Everything caused Larry pain. He could not get dressed or groom himself without pain. The pain got so severe that all he could do was lay across his bed. His wife took him into his healthcare provider where he was diagnosed with rheumatoid arthritis. Rheumatoid arthritis is a chronic condition that will often require multiple medications. Larry does not have any other health problems. He is currently taking Humira and Naproxen for the arthritis, and he says he rarely has pain. 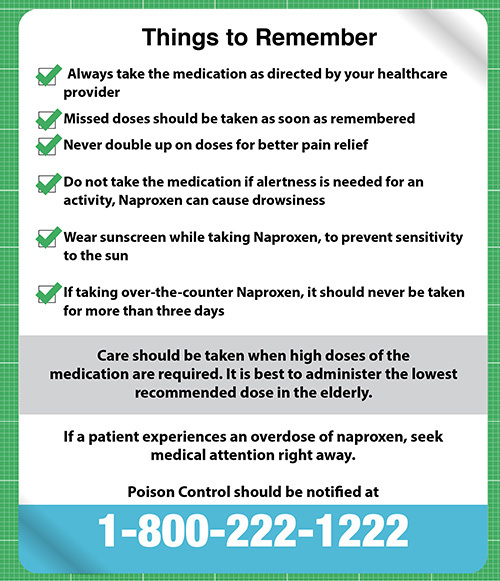 If a person experiences an overdose of Naproxen, he or she should seek medical attention right away. Poison Control should be notified at 1-800-222-1222. Signs of potential overdose include lethargy, dizziness, drowsiness, stomach pain, heartburn, indigestion, nausea, problems with liver function, disorientation, vomiting, difficulty breathing, and problems with kidney function. Patients should be managed by treating the symptoms and providing supportive care. There is no antidote for a Naproxen overdose. If a patient is seen within four hours of ingestion, vomiting may be induced. As a person gets used to the medication, side effects may weaken or disappear completely. 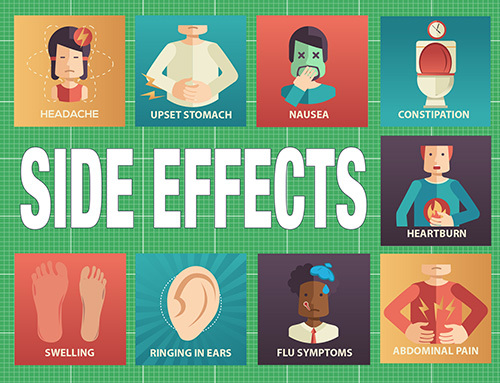 The most frequently reported side effects are headaches, upset stomach, nausea, constipation, heartburn, abdominal pain, and influenza-like symptoms. Janet has osteoarthritis and has been taking Naproxen for about three months. She explained to her primary care doctor that she had difficulty having bowel movements. The doctor instructed Janet to increase her physical activity and exercise at least 20 minutes every day. He also talked to Janet about her diet when she revealed what she was eating most of the time. The doctor noted that Janet’s diet was lacking in fiber, so he advised her to increase her intake of fiber-rich foods like whole grains, fruits like apples, oranges and pears, and vegetables. The doctor also provided Janet with a prescription for a stool softener for her to use occasionally. She implemented the doctor’s suggestions and was relieved of her constipation after a couple of days. Janet said that she used the stool softener on occasion but found the increase in activity and change in diet helped her with both her constipation and the osteoarthritis. Anise, arnica, chamomile, clove, dong quai, feverfew, garlic, ginger, ginkgo, Panna ginseng, and/or licorice may lead to an anticoagulant effect and increased risk of bleeding. Check with your doctor if you are considering using any alternative treatments in combination with Naproxen, even if they are natural. Patients taking Naproxen should always take the medication with a full glass of water and not lay down for at least 30 minutes. Always take the medication as directed by your healthcare provider. Missed doses of naproxen should be taken as soon as remembered. Never double up on doses for better pain relief; it is not effective. Do not take the medication if alertness is needed for an activity (driving, operating heavy machinery), since naproxen can cause drowsiness, dizziness and vertigo. Do not take naproxen with alcohol, for it can increase the risk of gastrointestinal bleeding. If you are having surgery, please inform your physician that you are taking Naproxen, for it increases the risk of bleeding. Wear sunscreen while taking Naproxen to prevent over-sensitivity to the sun. If taking over-the-counter Naproxen, it should never be taken for more than three days. If taking Naproxen for pain, it works better if it is taken when pain is still severe. Care should be taken when high doses of the medication are required. It is best to administer the lowest recommended dose to older adults. Also older adults are often over-prescribed medications, so make sure you discuss your complete list of medications with your doctor. Naproxen is not recommended for those with moderate to severe kidney disease, as it can have severe renal effects. The patient should inform the doctor immediately if he or she has swelling or experiences weight gain, fast heart rate, chest pain, weakness, slurred speech, or problems with vision or balance. Naproxen may cause life-threatening heart or circulation problems that could lead to heart attack or stroke, especially if the medication is used long-term. This medication should never be used prior to or after heart surgery. Patients that are coughing up blood, have black, tarry stools, and/or throw up vomit that looks like coffee grounds should contact their healthcare provider right away. Naproxen can cause serious problems with the stomach like bleeding or a perforation. These conditions could be life threatening and require immediate care. If the patient has a rash or skin irritation and itching, or if they have previously had an asthma attack or allergic reaction after taking aspirin or another NSAID, they should contact their physician. Taking naproxen if you have any of these conditions could lead to a life threatening allergic reaction. If the patient experiences nausea, fatigue, lethargy, itching, jaundice, right sided abdominal pain and flu-like symptoms, the patient should immediately stop taking the medication and contact their primary care provider. Naproxen is a medication that can be taken for both acute and chronic conditions. The affordability and ease of access of the medication makes it a good choice for people experiencing mild to moderate pain. Patients should make sure that their primary physicians are aware of any underlying conditions that he or she may have. It is important to inform your healthcare provider about conditions like asthma, heart conditions, depression and allergies. The physician may decide not to place the patient on Naproxen if the costs of being on this medication outweigh the benefits. Making informed choices about health care is important for patients and their families. Education about what to expect and when to communicate with health professionals can provide reassurance and should help alleviate the concerns of patients and their loved ones.